When I was a graduate student working on my MBA, the professors worked to ingrain in us the principle of satisficing. Satisficing, a combination of the word ‘satisfy’ and ‘suffice,’ is the process of finding a solution which will sufficiently satisfy the requirements, without necessarily finding the best solution. It requires a balance between the needs and the time and/or resources allocated to meet those needs. It is a principle that applies in everyday life and the workplace just as much as it did in graduate school. The process by which our professors endeavored to teach this principle was to assign more work than could be done in the allotted time if a student was continuously striving to complete each assignment to the best of his/her ability. If a student worked diligently, however, it was possible to complete all of the assignments satisfactorily. The professors recognized that most MBA students will work in very demanding careers and that they will need to learn to balance their work loads to achieve all that is asked of them. This will require some compromise–everything will not be able to be done perfectly, but everything can be done well enough to meet the needs. Those of us who learned this lesson early found ourselves graduating at the top of our class. Those who didn’t struggled to complete the program. The principle of satisficing works well in many areas of life, although I’m certain there are some areas in which the best solutions must be found. I personally employed this principle in my home as the very busy mother of three young sons. My oldest son was only 19 months old when my twin sons were born. I was determined to be the best mother that I could be and so I worked furiously to keep my house in order, cook healthy meals from scratch, and volunteer in my church while caring for these three very busy little boys. Consequently, I was stressed and exhausted most of the time. It didn’t take long to realize that I couldn’t do everything to the highest standard and maintain my sanity. I had to lower my standards to levels that would meet the needs sufficiently and satisfactorily rather than perfectly. My house was not ‘company ready’ all the time, but it was cleaned regularly and the boys always had clean clothes to wear. Sometimes I bought canned spaghetti sauce and boxed cake mixes rather than making them from scratch. Occasionally I rearranged the furniture to hide a stain I couldn’t get out of the carpet. Satisficing is a good principle to employ at Christmas time. The holidays can be a time of great stress for those who become overly focused on doing everything perfectly. We can never achieve the perfect holiday and striving to do so generally results in creating stress and chaos. For many years I resisted sending out a newsy Christmas letter in my cards because I felt it lacked the personal touch. I spent countlesss hours each December writing long, handwritten notes to each Christmas card recipient. The process took so much time that I would get behind on my shopping and gift wrapping. I would find myself rushing through the mall madly scrambling for gifts, rather than enjoying the sights and sounds of Christmas. When I found myself dreading sending out Christmas cards, I knew I had to make a change. Since I began typing a Christmas letter, the cards get done faster and are no longer a source of irritation and I have more time to enjoy other aspects of the holidays. This year I would encourage each of you to examine your holiday traditions. If something no longer fits your family or is causing too much stress, let it go. You can have a wonderful Christmas even if your house does not boast the best decorations on your street. Your holiday meal can be delicious and memorable even if you serve store-bought pies. No one will notice if your gingerbread house is slightly misshapen, or if you skip the gingerbread house altogether this year. You will likely never achieve the ‘perfect’ Christmas holiday but you may very well find a balance that will allow you to have a holiday that is sufficiently close to your ideal for you to feel a great deal of satisfaction. In the hecticness of Christmas, it is good to slow down and reflect on the true reason for this season, celebrating the birth of our Savior. The birth of Jesus Christ in a manger 2,000 years ago was the most significant event in the history of mankind. It is so easy to get caught up in shopping, baking, decorating, and the many other activities that go into our Christmas celebrations. One of the ways I focus my attention on Christ is to sing Christmas hymns as I go about my holiday chores. The traditional hymns reflect on the wonder of Christ’s virgin birth and it’s significance to mankind. Today, I’ve been singing “Hark! The Herald Angels Sing” most of the day. This beautiful hymn summarizes the entirety of Christ’s mission as “God and sinners reconciled.” Jesus birth, life, death, and resurrection were God’s plan to allow us a means to find forgiveness and be reconciled to him. Without Christ leaving His heavenly home and coming to Earth to live among us, we would be without hope. But, Jesus did come and offers to us atonement and eternal life if we only accept His free gift. And that is truly a gift to celebrate. Hark! the herald angels sing, “Glory to the newborn King! Please as man with ment to appear, Jesus our Immanuel here. Hail, the heaven-born Prince of Peace! Hail the Sun of righteousness! Second Adam from above, Reinstate us in They love. At this time of year, most people are in a generous mood. The Christmas spirit inspires us to share with those in need and we are bombarded with opportunities to give. From the Salvation Army’s red kettles to Toys for Tots drop boxes to food drives, there are ample choices for everyone to give to those needs that are most dear to their hearts. There are so many worthy charities that it is hard to decide which ones to support. Each year I struggle to balance the desire to give to every great cause while staying within my budget. So I want to share some steps that have helped me in making these tough decisions. 1) Ask God for wisdom in determining which charities to support each year. If we all followed God’s guidance with our giving, all the needs would be met. 2) Decide how much money you can afford to give and stick to your budget. I once read a definition of debt as “misguided charity.” Being overly generous can lead to financial difficulties just as surely as greed and selfish spending. 3) Support charities whose values line up with your own. As a Christian, I support charities sponsored by Christian organizations. While I recognize that the beneficiaries of charitable giving appreciate the assistance regardless of the source, I want to share the message of Christ’s love while blessing others. The following are some of the charities that I have supported over the years. 1) Angel Tree–This ministry of Prison Fellowship provides gifts to children of prison inmates. They desire to reconcile prisoners with their families by delivering gifts to the children in the name of the incarcerated parent. 2) Operation Christmas Child–A ministry of Samaritan’s Purse, Operation Christmas Child has delivered nearly 100 million Christmas gifts in shoeboxes to children all over the world. Each box contains materials that share Christ’s love and plan of salvation with the recipient. 3) Salvation Army–Through their red buckets and their Angel gifts, the Salvation Army blesses needy children and senior citizens. The Salvation Army’s mission is to reach the lost, the last, and the least with the message of Christ’s love. 4) Toys for Tots–This toy drive is sponsored by the Marine Corps and Marine Corps reserves and provides toys to disadvantaged children. The mission of Toys for Tots is to provide a message of hope that will assist children in becoming responsible, productive, patriotic citizens. 5) Food banks. I donate to my church’s food ministry and our local food bank. It’s hard to share Christ’s love with people who are hungry. When we feed people, they know we care about them and it makes it easier for them to believe that Christ loves them. That’s my list of favorite charitable organizations. What are some of yours? What other ways to you share Christ’s love at Christmas? Christmas celebrates the beginning of Christ’s earthly journey and the hope that He brought to the world. As we give Christmas gifts to those less fortunate than us, we have an opportunity to share Christ’s love and the infinitely valuable gift He gave us when He left his home in Heaven to live among man and ultimately pay the price for our sins. Please pray and ask God to direct your giving this year. If we all give as God leads us, many needs will be met and many lives will be changed. The true message of Christmas is that Christ came to Earth to change lives. Christmas is six weeks away, but it’s not too early to start getting in the Christmas spirit by blessing others. Like many churches around the country, my church is participating in Operation Shoebox, a ministry of Samaritan’s Purse.The girls in our Girls Ministries program filled shoeboxes with gifts to be given to a boy or girl in a foreign country. For many of these children, it will be the first Christmas gift they have ever received. Each of our seven classes filled one or two shoeboxes. A few of them are depicted below. 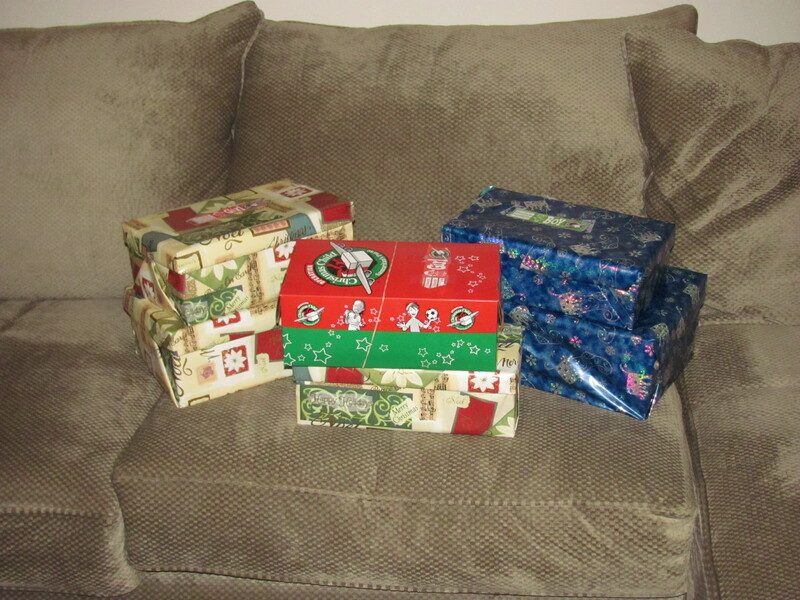 Shoeboxes to be sent to Samaritan’s Purse to distribute to children worldwide. There is still time for you to participate in this important ministry. You can use your own shoebox or pick up a decorated box at your local Christian bookstore or Chick fil A restaurant. If you use your own, please wrap it in Christmas paper. Fill the box with some toys, personal hygiene products, school and art supplies, hard candies, or other small gifts. Use your imagination and ask God to give your ideas for your box. Box collection started today and goes through next Monday, November 19. It’s not too late, but time is running out. If you are able to participate, you will bless a child and share with them the true spirit of Christ. And in doing so, you will be blessed in return. These words written by Henry Wadsworth Longfellow during the Civil War are still true today. Hate is strong and peace is not found in the world. Yet, it is possible to be at peace and to find peace and forgiveness in your heart. True peace comes only from knowing Jesus Christ as your Savior. Christmas is the celebration of the birth of Jesus Christ as a human baby. Jesus left his home in Heaven and willing came to Earth to live as among us and to sacrifice His life for us. Without Christmas, there would be no Easter—no death on the cross, no resurrection, no hope of salvation. As you celebrate Christmas in a few days, I pray that the true meaning of Christmas will bring joy and peace to your heart. If you don’t know Jesus Christ as your Savior, there is no better time to invite Him into your heart. I’ve knitted dozens of Christmas stockings over the past 37 years since my grandmother turned the duty over to me. Most of them have featured traditional Christmas figures, such as Santa Claus, snowmen, and gingerbread men, on a red or green background. I’ve even made a few on blue backgrounds. Until now, however, I have never knitted a lavender Christmas stocking. The occasion for this non-traditional stocking is the impending birth of our first granddaughter. Two years ago, I made a pair of stocking for our son Matt and his wife Kristin for their first Christmas as a married couple. They both chose a puppy pattern and, rather than having identical stockings, ask me to adapt the colors to look like their two dogs, Jasper and Allie. With the expected arrival of their first child, a daughter to be named Brooklyn Elise, they wanted me to knit another puppy stocking. The puppy on Brooklyn’s stocking has dark gray ears and a tan face on a lavender background. 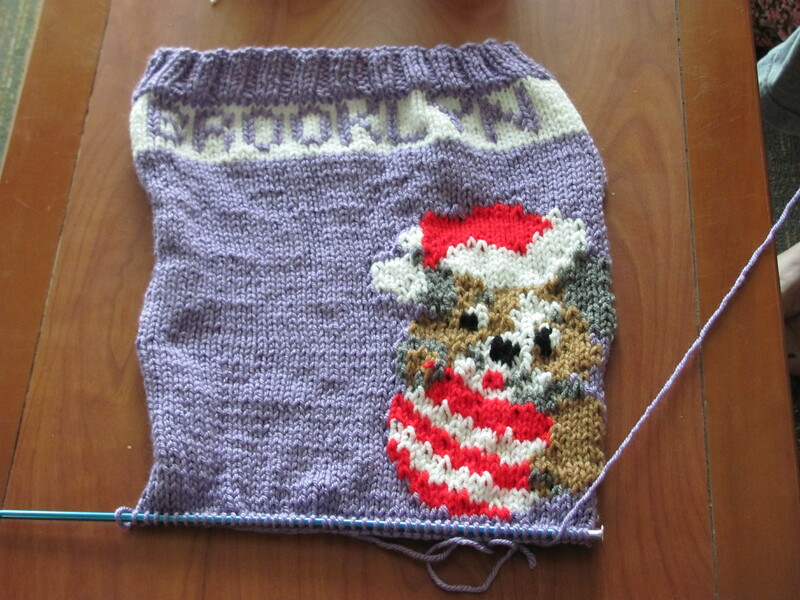 It is coming along nicely, except that Brooklyn is a rather long name to fit on one side of the stocking. I didn’t consider that when I stitched the name on it. As it currently is, “KLYN” would show when the stocking is hanging. Fortunately, I didn’t knit the name into the stocking but embroidered it on in duplicate stitch, so I can easily removed the stitched and rework it with “BROOK” on the front and “LYN” on the back. My alternative plan is to try to free -hand the name using a back stitch. I’m going to let the partents-to-be make that decision. Last Christmas, I knit a stocking for our first grandson, Daniel. It was a wonderful delight to carry on the family tradition begun by my grandmother and make a stocking for the first member of our family’s next generation. Daniel is too young to understand the family tradition yet, but I believe he will also treasure his special Christmas stocking. Brooklyn is due January 7th, so unless she makes an early entry into the world, she will not be here to celebrate Christmas with us this year. We will hang her stocking, however, and thank God for this precious new life and the wonderful blessings He bestows on our family. My parents celebrated their 55th wedding anniversary on Friday. They were married on Christmas Eve and celebrated Christmas with their families the next morning before leaving for their honeymoon. Getting married on Christmas Eve makes it easy to remember the date, but it makes a romantic celebration nearly impossible. The last time I remember my parents going out to dinner on their anniversary is the year I was eleven. They were home early and declared they would never attempt it again. Few restaurants are open on Christmas Eve, and even fewer have employees who are happy about having to work that night. My parents had nine children born over a 21-year period. Consequently, their Christmas Eve activities for the first thirty years or so typically involved wrapping Christmas presents, assembling bikes and other toys, and baking pies for Christmas dinner. Their anniversary was almost an afterthought in all the chaos of Christmas, but they always took a few moments to exchange gifts and express their love for each other. Christmas Eves are a bit calmer for them these days. More restaurants are open, but they still don’t go out on their anniversary. They prefer instead to have a quiet celebration surrounded by their children and grandchildren. They celebrated their anniversary this year with four of their children and three of their grandchildren present. My sister and I brought the food, so Mom was spared the chore of cooking dinner on their anniversary. I am grateful that my parents’ marriage has withstood the many challenges life has brought their way, including the death of one child and my father’s 26-year career in the U.S. Marine Corps. I am thankful that my parents are both active and healthy and can look forward to many more anniversaries. But most of all, I am eternally grateful that many years ago my parent’s committed their lives to Jesus Christ and made Him the center of their marriage.